I certainly don't. What kind of baker only makes muffins? Personally I prefer cakes. But pastry preferences aside, there's one thing I do know - and that's that Maestrea is awesome and always strives to have a better tomorrow. And that means having updates! So many updates, so little time. Maybe the Muffin Man can whip you up some snacks for an even better update-reading-experience? Enjoy your fresh-baked Maestrea-filled Updates! Added 120+ achievements! Compete for the leaderboard with /aach list, /aach top and /aach to see all the commands! Shady is often seen providing helpful tips and tricks for people in chat, providing assistance where he can, and overall keeping chat upbeat and cheerful. You can often find Shady participating in various server activities and being part of the community. This week's challenge is, as per usual, inspired by our Outstanding player. Take some time to help some other folks out in their quest to riches and get them started with their jobs. This could be anything from setting up or sharing grinders, to giving out some good tools or items. 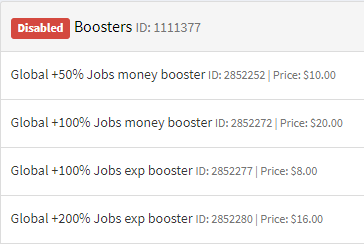 While not necessarily more of a challenge, if you've got cash to spare you can check out the new global boosters available via donating. QoL: Checking through old Suggestion posts. Want a faster response on yours? PM ParadiddlePride#9265 on discord. excellent job on the update, para! Thanks for the update Para!